Papers submitted to Complex Systems should have results and presentation that are accessible to a wide readership. Include the names, addresses and telephone numbers of suggested referees. Acknowledgment will be sent when a paper is received. 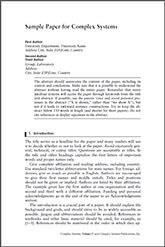 The sample paper has information regarding editorial style and document formatting. Contributions submitted as Wolfram Notebooks are preferred. The sample paper, along with Wolfram Mathematica and LaTeX author templates, are available. Papers sent in other formats or in hard copy form will require longer processing times. For the added benefit of authors, there are no publication charges for Complex Systems. A set of 25 reprints is also provided free of charge for papers published in Complex Systems.